I've tried to write this review 5 times over the past 10 days even during my outage. I've failed each time. I can only come to the conclusion that I'm not articulate enough do describe The Dark Knight's magnificence. This is not to be seen as a failure however, my "writers block" should be construed as an indication to you of how great this movie is. I knew it was going to be the best movie of the year. I spent about €200 on a day trip to the colossal BFI IMAX theater in London just to see it. All I can say was since even before the death of Heath Ledger, the rumblings for this movie were all positive. Everyone who got a glimpse of the effects work, script and workprint previews were left as speechless as I was- or perhaps they knew what a gem it was and didn't reveal anything prematurely. Nevertheless, nothing remotely negative was said about it before and I've not heard anything to that effect afterward. (Well maybe Christian Bale's voice while he was obviously choking in his Batman cowl was a bit to silly and it did look like his lips were being pursed by the opening in the mask - but these are minor quibbles). Ledger's Joker is the greatest Comic-Book movie villain ever, but not worthy of an Oscar. If an Oscar should be given- it should go to the team responsible for the Harvey Dent/Two Face makeup and CGI FX. Final Verdict: While Iron Man my have been my most anticipated film of all time and it certainly did not disappoint on any ground, it doesn't even come close to The Dark Knight which I'm forced to declare as the film of the year. As good as Quantum Of Solace is hoped to be, it's unlikely to better it either. See it in IMAX if possible - the aerial shots are amazing. So you liked it then, Ho Ho, I kid! Seriously though it was a good movie, but not perfect. It was a bit over long. Like the Tim Burton era of Batman movies, Batman/Bruce Wayne started giving way to the villains. This makes sense as Batman is a story enabler for these zany creations. 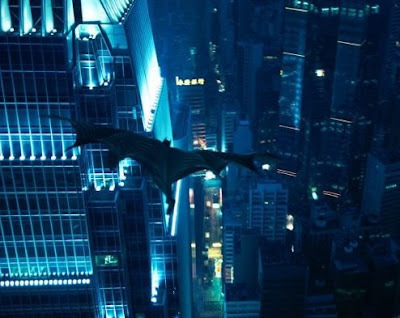 I watched Batman Begins subsequently and I have to say the Batman part of that story, which is what I enjoyed the most, is not present in Dark Knight. I think that Nolan knew this was happening. The bits I would have trimmed from the movie time/story wise are the bits that only relate to Batman/Bruce Wayne. In particular the whole bit where Bruce has to stop his former employee from been killed using the Lamborghini. WTF was that all about. Any way thankfully Sydney has an IMAX so I hope to get to see the movie there. I'll be interested to see where he/they go with another sequel. Lets not have a rehash of spider-man 3. If they make Christain Bale do the Batusi that's it I'm out. Film of the Year?, all well and good Lt.Col but does it knock Transformers of your top spot of film of the decade? Easily the best film of the decade. If you don't think so, then, well, you might just be dead inside. Bruce, Can you be more precise?, Transformers or The Dark Knight?. Are we discounting religious films like Star Wars and LotR? Sithy, it's the Lt.Col, that has set the scope, previously he declared Transformers the greatest movie of the Decade, there are two important things to define here, the first is, what the Lt.Col meant by "Decade", the good folks at Collins English Online Dictionary defines a Decade as a Noun, a period of ten years. If we take the word of the afore mentioned good folks at Collins, this gives us a period of time, so only those films made within or initially released within this window of opportunity may be considered. Which leads into the second thing we must define, when exactly did the ten year period start?, from the start of the century?, 2001 to 2010? or from the first granting of the title "greatest movie of the decade"? 2007 to 2014?, either way, I'm afraid the very title rules out the religious movies, the original Starwars trilogy and who wants to compare either Transformers or The Dark Knight to such rubbish as the Prequels, as Bruce puts it, "Only someone who's dead on the inside", That leaves us with the three LOTR movies as possible contenders for the title, Sibling rivalry indeed!. Anyway I digress, I submit that until the decade is over, it is impossible to define what movie is the greatest of the decade. As such the only certain thing is that the Lt.Col is given to hideous hyperbole. @ Doug: I'm very worried about Batman "3", we all know too well what usually happens with the second sequel! @ Civvy: No. It's not "Film Of The Decade", it's too "dark" to knock Transformers off the top spot. The movie would have to be more original than Transformers. Transformers had never been done. The magic of that experience can never be taken away. Batman however has many movies and incarnations. The Dark Knight was a variation on a theme (the best variation ever) but it has been done. Transformers originality (and incredible explosions) gives it it's edge. The Dark Knight would be a close second if you need to know. @ Sithy: When speaking of movies, I always discount Star Wars for religious reasons. @ Civvy again: Around here: One decade begins e.g. in January 1st 1980 and finishes on December 31st 1989 - that was the '80's. It's not impossible to define what movie is the greatest of the decade assuming that it can be replaced at any time before Dec 31st 2009, so, so far- It's Transformers. Oh and Pints just gave birth to a daughter, so she's probably a but too busy but still alive. Thats historical revisionism, mind you, if it's in defense of freedom, I'll allow it.